This game is so big that we thought we'd approach this one from two angles. We've got Edwin and Tory covering this one, so it's more of a chat format than anything else. [Edwin] RalliSport Challenge 2 as the name implies, is the second installment in the RalliSport Challenge franchise -- and it's the first racing title in the XSN Sports lineup. 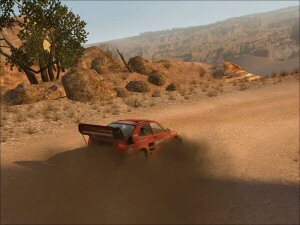 Sporting a new graphic upgrade, new race modes, more cars and tracks, the fun does not stop there. There is online play using Xbox Live, and players can even set up leagues and tournaments using XSNsports.com. [Tory] I was stoked when this game came out having loved the first game that was a launch title that absolutely blew me away. 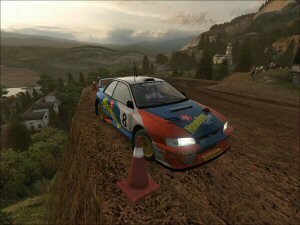 Rallisport was the first racing game that I'd played that achieved levels of realism that amazed me and had my wife thinking that she was watching actual racing on the television. This was of course until she noticed the same car plunging off the cliffs in spectacular fashion. Upon which she noted, "That driver is pretty bad isn't he?" [Edwin] The game has a lot more tracks than the original, but I am not so sure about the boxes boast of 90 tracks. Since some of the tracks are re-used but for different paths and harder competition. But I do not think race fans will have any gripes about that because the races are fast and furious enough to keep you on the edge of your seat and concentrating on keeping control rather than the number of tracks in the game. As the dust spreads and the rooster tails fly, the player will be happy to know that there are at least 40 types of cars, and variable weather conditions to make things interesting, there is enough here to keep even the skilled on their toes and even more to make someone new to RalliSport cringe as they make their way along at break neck speeds on these awesome tracks. Tracks range from the Pacific Northwest, Nordic with it�s ice and snow covered challenges and even some hot racing in Australia! Once your done playing by yourself� koff koff, try your hand at some real challenges, step on into the XSN Sports games online world. Using Xbox live players can compete in a virtual sporting league. [Tory] Multiplayer can be daunting sometime, especially with competitors all around the world battling it out. Ping times matter, even with broadband, and the fastest connection wins amongst equal drivers. I found that RSC2 powered along online. Rally titles are about the only car driving game that I can be bothered with for the long run and this is one title that both Ed and I agreed would be a keeper. The game has simply improved upon a already brilliant base and gone skyrocketing in terms of quality. Add to that the ability to put your custom soundtracks in and I was soon racing along to the dulcet tunes of the new Slipknot album! For those of you who don't care what they listen to, sound is looked after on the cd itself. [Edwin] Along with the awesome experience of dashing around trying not to smash yourself up, there is some awesome visuals to enhance the whole experience. Missing hoods, smashed windows and the graphical looks do not stop there. Track weather comes into play in a really grand way. Rain on the wind screen just looks great, lighting, snow and dirt on the car never looked so good. As the player races into dreams of glory and more challenges during career mode, advancements in career mode works on a point system. Within four tiers there are well over 100 events to try your skills in. Some races make things a bit more of an interesting skill challenge because some of the events have more than one race in them. Players will soon find the first tier is a lot like a test for themselves to get used the things because this first tier is very easy to beat, but after that all bets are off. Now I admit that most times a race game to me is a passing fascination that merits a couple go rounds, maybe enough to do a review. 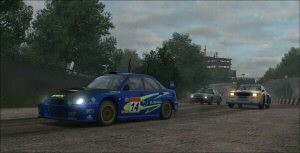 But to tell the truth RalliSport Challenge 2 is one of the best Xbox games out there, and I think I will be playing this more than just a couple of times. [Tory] I fully concur here. RSC2 plain and simple pumps and we knew when we put the perfect score up that we will probably cop some flack. But in all honesty we don't care and for those of you who do have a problem with a 10 being given, see you on the track!